Red Hot Chilli Pipers play Cardiff! Bagpipes with attitude, drums with a Scottish accent and a show that should carry its own health warning! 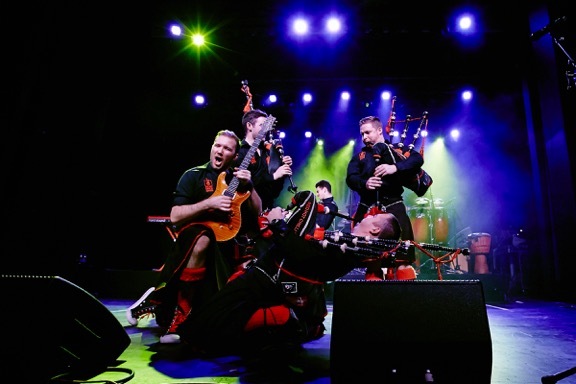 Known for their infectious style of feel-good music – the Red Hot Chilli Pipers have sold out shows across the globe, including the USA, China, Australia, Germany, Switzerland, New Zealand and France. Described as ‘the most famous bagpipe band on the planet’, they have performed for a string of A-listers including Paul McCartney, Samuel L. Jackson, Ewan McGregor, and even Her Majesty The Queen. They have played the main stage at one of the UK’s largest festivals – T in The Park, and other major events including BBC Proms in Hyde Park, The Rugby World Cup and Bahrain Grand Prix. They have some other impressive figures under their belts (or should we say kilts) including a triple platinum album, millions of views on Youtube and hundreds of thousands of Facebook followers – when it comes to these boys, the hype is definitely worth believing. Get ready for an utterly unique experience as the Chilli Pipers fuse traditional Scottish music with rock and pop anthems including the likes of Don’t Stop Believing and We Will Rock You. This is certainly going to be one performance to remember!